Is nothing -- even self-promotional 140-character missives -- sacred? Danica Patrick is here, Twitter fans, and she has some great watch ideas for you. Twitter is, if nothing else, the perfect blog platform for athletes. No sitting down at a computer. No formatting blog software. No designing (or paying someone to design) a fancy, flash-based Web site. Just the athlete, their mobile phone, their love of texting, and your eager eyeballs. This formula has given way to Charlie Villanueva (who famously tweeted at halftime of an NBA game), Kenny Smith (less an athlete now than a broadcaster, but still) and the king of all athlete streams, THE_REAL_SHAQ. Shaquille O'Neal has taken the medium to new heights, actually, hosting contests and impromptu tweet-ups with his now-plus-one-million followers. Fans connecting with players through the power of the Internet? It actually, finally happened. And now it's going to end. 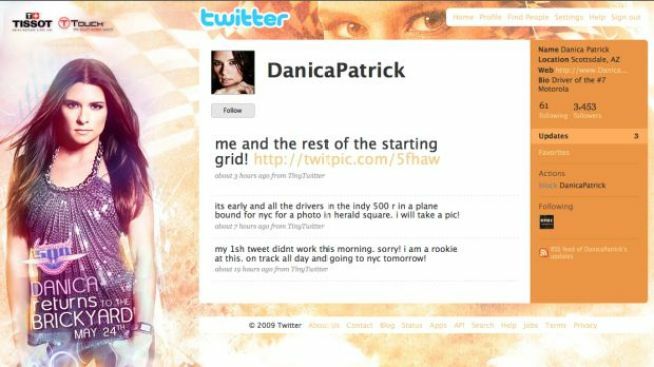 Danica Patrick just launched a Twitter feed at the behest of one of her sponsors, watch company Tissot, who will receive, as the Sports Business Journal writes, "extension exposure on [Patrick's] feed, including visual branding on her Twitter Web page." Tsk, tsk. Didn't Patrick get the memo? Twitter is supposed to be about blatantly promoting yourself. Not a company that's paying you! O'Neal, the king of the medium, is also going commercial, including energy drink maker Enlyten in his "self-made" viral videos. Much as we hate it, this seems like a way forward for athletes interested in getting paid for nearly everything they do. From their viewpoint, it makes perfect business sense, and we don't begrudge them for making that paper. But as sports fans, the idea of getting unfiltered access and communication with athletes via Twitter was exhilarating. The idea that those transmissions will now be exactly as authentic as a Go Daddy commercial makes more than a little bit sad.